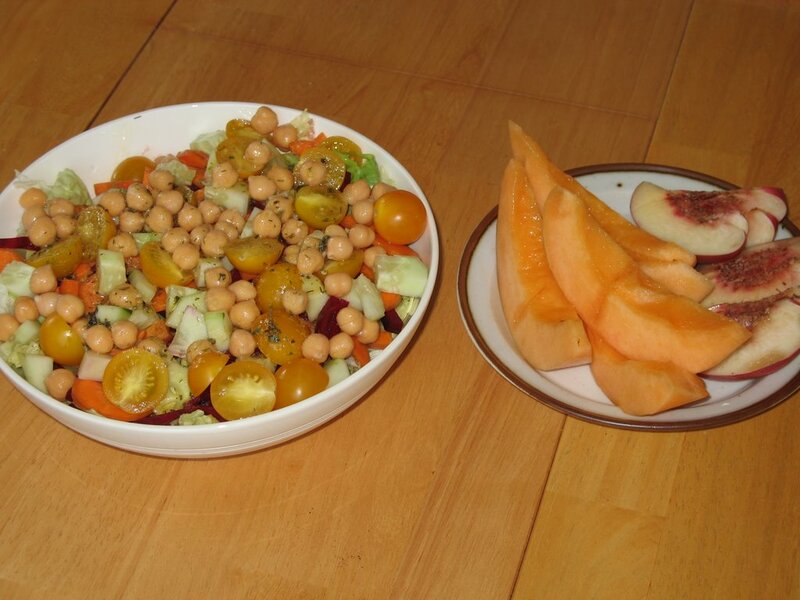 Today for lunch I made myself "Giant Salad"... chock full o' veggies with some yummy flax seed oil dressing. 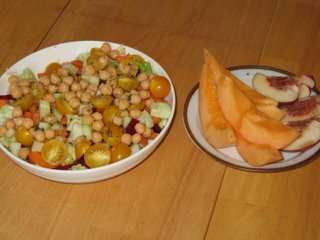 Of course, since I love fruit, I had some melon and a white nectarine too. This summer I have been buying such incredibly tasty organic peaches and nectarines at the farmer's market. It's just amazing. I've pretty much given up on store-bought stone fruits because they are either bland or mushy or both! These ones from the farmer's market are just amazing. I've got one left for tomorrow... just in time for another market on the weekend. When I got home late from teaching yoga tonight, Musty told me that he had already created a grand plan of going downtown for some Chinese food. 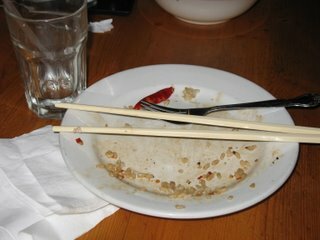 I don't really love Chinese food, or eating out for that matter, but this particular place makes a mean "Hunan Tempeh" that is tasty and feels moderately healthy, full of veggies. As you can see, I forgot to take the picture when the food arrived! Ooops! My really super cool aunt came with us, which was really fun. After dinner we walked over to Santa Cruz's most beloved independent bookstore, Bookshop Santa Cruz. It's always open late, and always fun to look around. Bookshop carries my line of greeting cards, so I also like to check in on how many designs are sold out, which ones are top sellers, etc. They have been a big supporter of my project, for which I am really grateful. After scoping out that scene... my aunt and I went over to the kids section, where I happened to open up a book called "Little Fur Family" - HOORAH! To make a long story short (no pun intended), I fell madly in love with this sweet, gentle little tale and had to buy the book for myself - as I deemed that I could not live without it. It includes a section where the little fur baby finds the littlest fur animal in the wild forest and kisses its tiny fur nose and then sets it gently back down in the grass. Very vegan-friendly! !